About your instructor: Dr Felicity (Flis) Lawrence is an adult educator and her mission is to provide you, leaders, managers and HR with a proven methodology to quickly and accurately spot and safely stop or prevent unhealthy on-offline behaviours and attitudes, and a framework that builds healthy work cultures. She works with individuals, leaders, HR and L&D practitioners around the country. Her PhD dissertation investigated the impact of unhealthy online (and off-line or face-to-face) communications on people and work culture, for which she was nominated for two awards. This research dovetails with real experience accumulated during 25+ years work experience in private, military (RAN) and public sector workplaces, during which time she was honored to receive two Australia Day medals, Outstanding Service and Merit awards. Contact Dr Flis at team@drflis.com or LinkedIn. click here to Enroll 4 free! This FREE mini-course gives you 10 tactics to help you safely interrupt or stop bullying behaviours without getting victimised in the process. Learn how to stop, control or defuse workplace bullies PLUS tips to spot the tricks bullies use to control you. Find out how some bullies reel you in, and discover what they really want from you (power and control). Discover why it’s critical to quickly recognise the underhanded, passive-aggressive or visible behaviours of a workplace bully. Get simple steps to re-discover your personal power and safely beat bullying behaviours using 10 powerful tactics. AUDIENCE: You, leaders, workers, L&D & HR professionals, people in workplaces who are seeking new methods to prevent or control potentially toxic workplace behaviours from escalating to bullying and harassment. CONTENT: Research has confirmed that without interruption, workplace violence will always escalate. The solution is to develop the skills and expertise to confidently recognise and interrupt unhealthy, dysfunctional or toxic behaviours and attitudes before it escalates out of control. 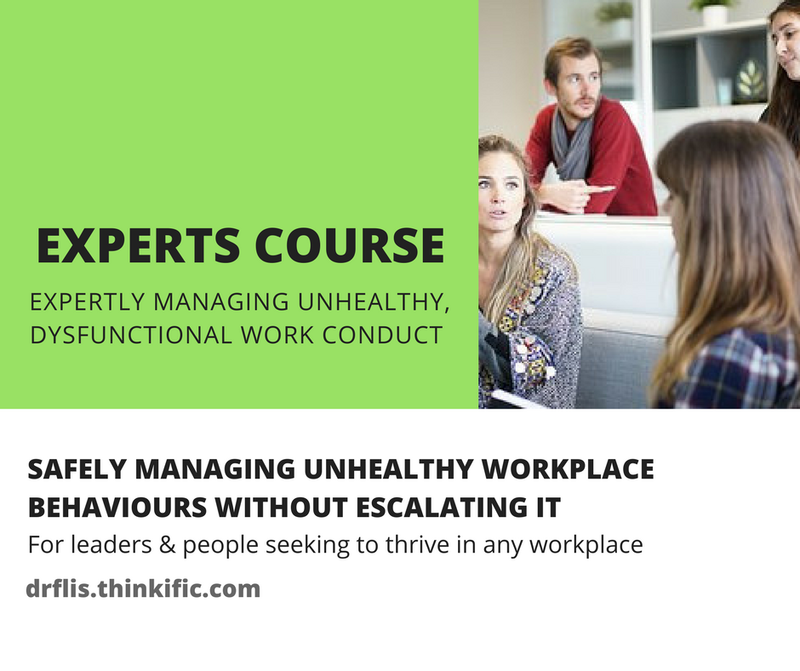 Learn these simple strategies to expertly, safely and confidently manage and deal with unhealthy, dysfunctional or toxic workplace behaviours before the behaviour escalates, and getting burnt in the process. This course gives you the HOW and WHY unhealthy or dysfunctional behaviours like head-to-head arguments and conflict manifest. PLUS you get Tailored Toolkit to help you deal with the unhealthy, dysfunctional or toxic behaviours and attitudes in your 'workscape'. WHAT THIS COURSE GIVES YOU: The skills and expertise to confidently to deal with unhealthy, dysfunctional or toxic online or offline conduct in your workplace without making the situation worse or getting harmed in the process. You will also understand how and why unhealthy workplace behaviours and attitudes develop. AUDIENCE: Anyone working in medium to large organisations including leaders, employees, L&D, OHS & HR professionals who are seeking tested and safe methods to prevent or stop unhealthy workplace behaviours from impacting people's mental health, well-being and engagement. COST: AUS$45.00 (+GST for AUS participants only). International currencies are automatically converted on payment and are based on daily foreign exchange rates. Download your COMPLETE WORKBOOK & Tailored Response Toolkit. Keep this workbook open! Please complete this 2 MINUTE SURVEY! How do you stop negative workplace behaviours before it turns toxic and becomes bullying and without getting burnt in the process? Great question! This course gives you the HOW and WHY behind negative conflict and confrontations PLUS a Tailored Response Toolkit that gives you specific tactics and tools to help you expertly deal with toxic behaviours in YOUR workplace. WHAT YOU GET: The HOW and WHY behind negative or toxic workplace conflict and confrontations and a TAILORED RESPONSE TOOLKIT with strategies, tactics and tools to help you expertly deal with toxic situations in YOUR workplace. COST: AUS$397.00 (+GST for AUS participants). International currencies are automatically converted on payment and are based on daily foreign exchange rates. Download YOUR WORKBOOK for Sessions 1 to 4 . Keep this workbook open! WHAT YOU GET & KEEP: 3 Videos, 10 Webinars, 1 Workbook, 1 FREE Goodie Bag with loads of tactics and tools. At the end of this eModule you will take away your own TAILORED RESPONSE TOOLKIT to dip into at work. At the end of this eModule you will take away your own TAILORED RESPONSE TOOLKIT to dip into at work. AUDIENCE: You, leaders, workers, L&D & HR professionals, people in workplaces seeking to enhance their political nous and success at work. Are you confused about why you just don't fit in at work, despite your best efforts? You find you work harder and longer than your co-workers, yet get ignored? Or you find yourself waking up in the morning and going to work, but consistently get a sense that you're missing something vital in your life...? Research confirms that gaining a greater self-knowledge and understanding about what drives your passion (your life's purpose) will help boost your chances of gaining a career that suits YOU and creates the environment where can you succeed@work & life. CONTENT: You will learn HOW and WHY your workplace and/or your work behaviours may be setting you up to be less successful, what makes you tick and how to use this knowledge to create a more successful work-life with an expert showing you the way. 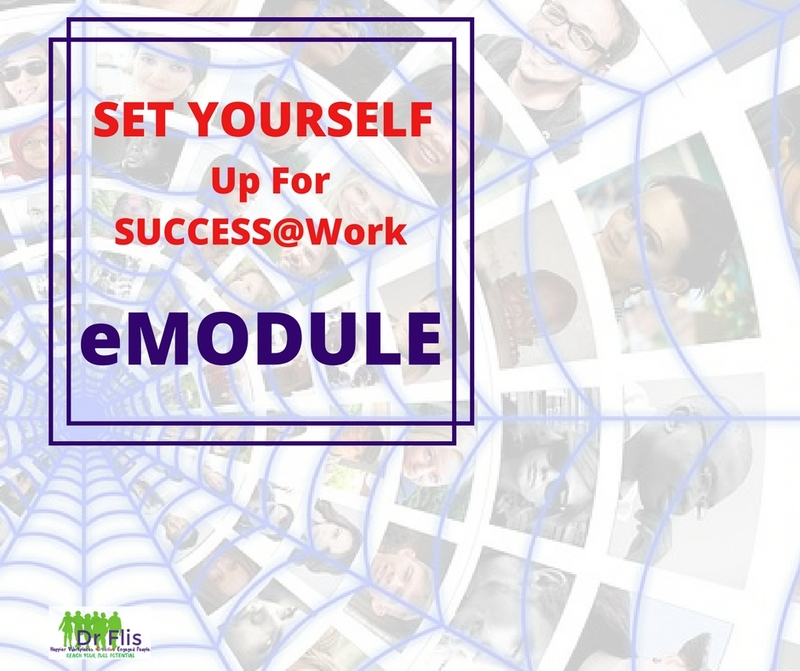 Thank you for registering or enquiring about my 'Set yourself up for success@work' module. Congratulations! You've decided to take ACTION and learn powerful and highly professional strategies and tactics to aim for, and attain, the success that best suits YOU and your needs. Academic & sports research has consistently found that the more you focus on & plan out your goals, the greater your chances of success. DISCLAIMER: The information provided is not intended to be a substitute for specific independent medical advice, nor is it intended as a self-treatment program. Responsibility for treatment decisions, especially the prescribing of medications, remains with you and with your psychologist, GP or therapist.